This chapter is geared primarily towards folks who already have familiarity with OSGi, which stands for Open Services Gateway Initiative. The idea behind OSGi is adding and removing modules to a Java application without the need for restarting. TornadoFX supports OSGi and allows highly modular and dynamic applications. If you have no interest in OSGi currently, you are welcome to skip this chapter. However, it is highly recommended to at least know what it is so you can identify moments in the future that make it handy. some very interesting features which we will discuss. are also a good starting point reference for basic OSGi patterns. even when your application shuts down. reference these styles, and the stylesheet bundles can create selectors based on them. a fictive MusicPlayer view to be docked into the dashboard when it&apos;s bundle becomes active. override val discriminator = "dashboard"
https://www.youtube.com/watch?v=liOFCH5MMKk that shows these concepts in action. FX.osgiConsoleShortcut or programmatically opening the OSGIConsole View. already be bundle with some of these, so check the container documentation for further details. 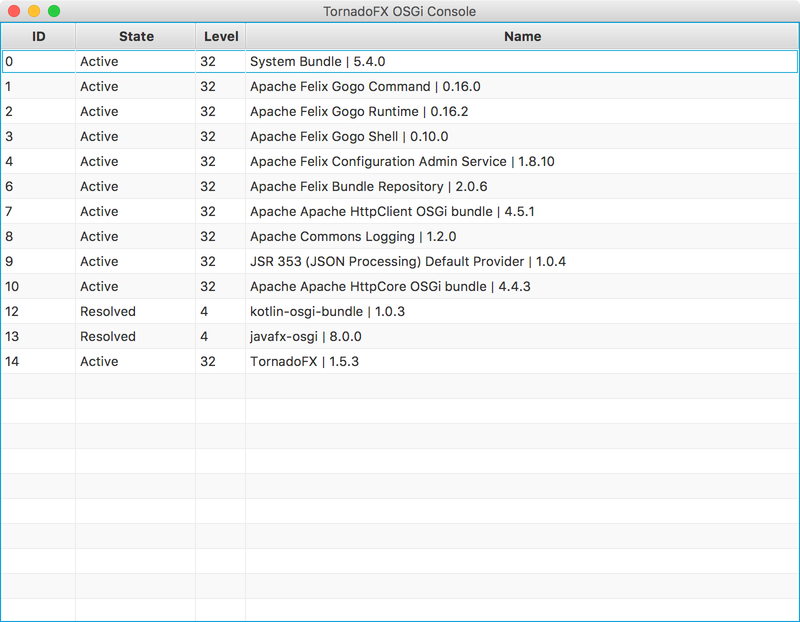 ** This links to the Apache Felix implementation of the OSGi Config Admin interface. has the Config Admin bundle loaded, so you won&apos;t need it there.